With the holidays quickly approaching, are you ready to throw a winter wonderland party in your outdoor space? Whether you plan an adults-only cocktail evening or a children’s gingerbread house decorating party, we have plenty of ideas to ensure your event is a delightful affair with beautiful decor, cozy seating arrangements, and delicious food. Take a page from favor and gift company Kate Aspen and offer guests a hot cocoa station. Create a festive chalkboard sign, and, depending on the age of your guests, set out personalized holiday mugs, dainty China, or sturdy Styrofoam cups. Offer carafes of premixed cocoa. 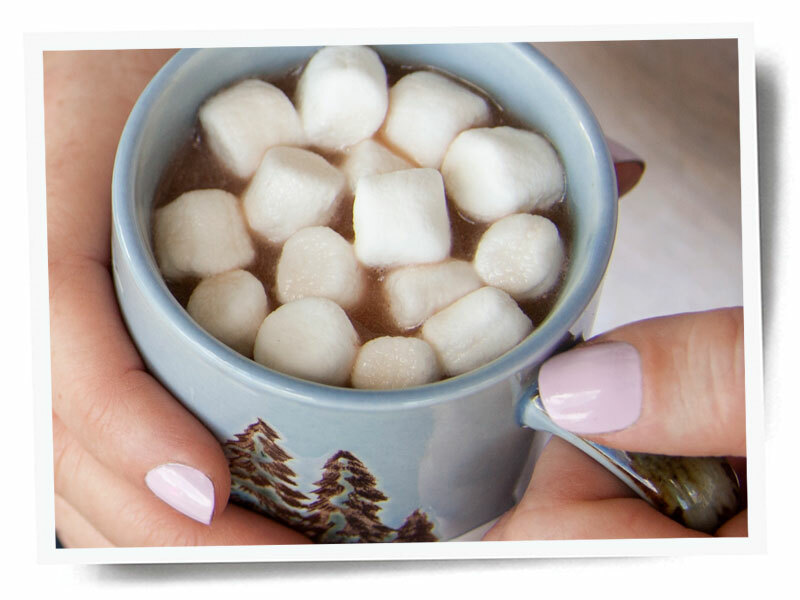 Fill jars or bowls with extras—marshmallows, marshmallow fluff, whipping cream, crushed peppermint, and chocolate or white chocolate chips so guests can personalize their cups. We also love spoons dipped in melted chocolate and rolled in crushed peppermint so partygoers can neatly stir in their toppings. For a grownup party, add bottles of flavored liqueurs like Bailey’s and Kahlua. DIY blog Yellow Bliss Road offers free chalkboard-style hot chocolate station printables. Speaking of flavored liqueurs, offer sparkling holiday cocktails. Warm up red wine and blend with cloves, lemon, cinnamon and sugar. Go old school Christmas with Wassail, a British cider punch. Or offer Irish Coffee or Hot Toddies. Whatever you choose to serve, you’ll ensure your guests remain warm and fuzzy. 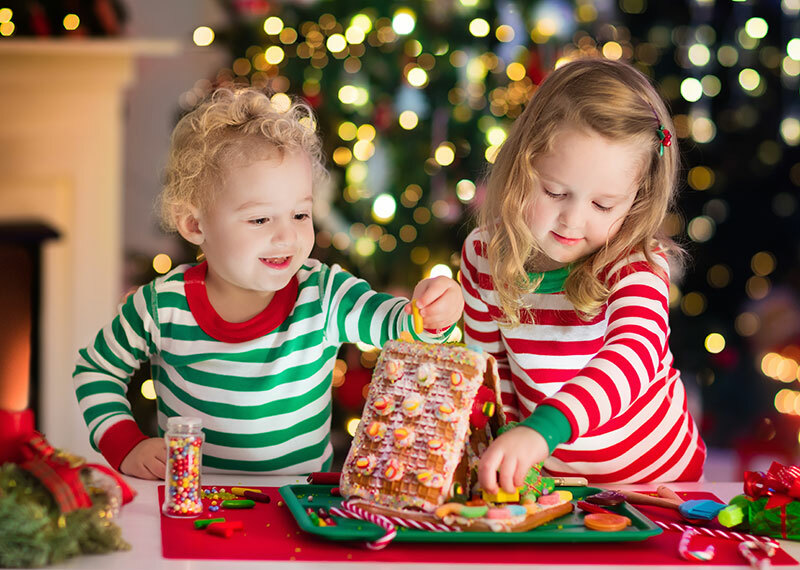 A perfect DIY activity for little ones, gingerbread houses also make beautiful table centerpieces. Check out the Gingerbread House kits from Trader Joe’s. Add DIY gumdrop trees as part of a whimsical centerpiece. Let your patio twinkle with the ambient glow of lights woven throughout the trees, the garden, or a pergola. Check out our Illuminate the Night with Strings of Light post for a list of our favorite string lights. Make your trees “rain” lights with these LEDs, which emulate falling snow in the night sky. Or add LED Starbursts to your trees and patio eaves. Whether you go natural or prefer fake, light up the night with a fir. 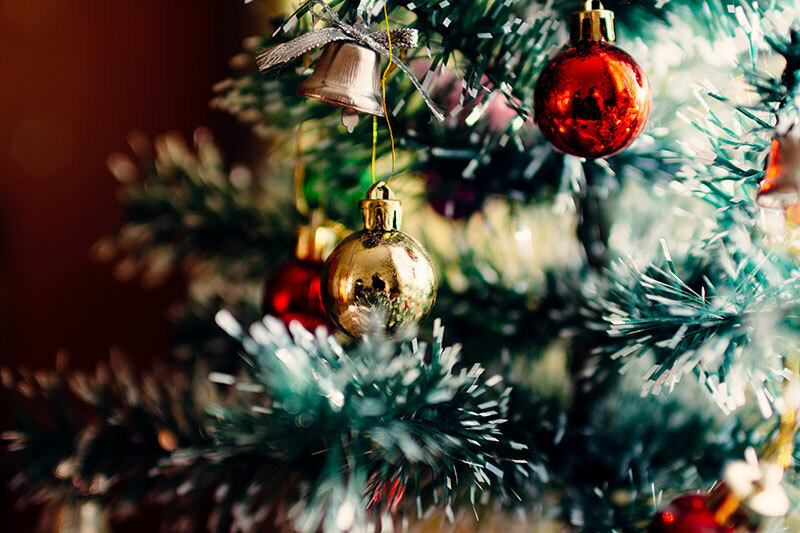 Choose from a full-size tree, or go with a tabletop size, depending on the amount of space you have. Trim your tree in classic white lights and add ornaments that fit your home’s style. We love the intricate patterns of these delicate paper snowflake ornaments from Luna Bazaar. To finish the tree, add a plain tree skirt or wrap the base in this classic Buffalo check plaid tree skirt from Woolrich. Get plenty of mileage out of cozy throws. 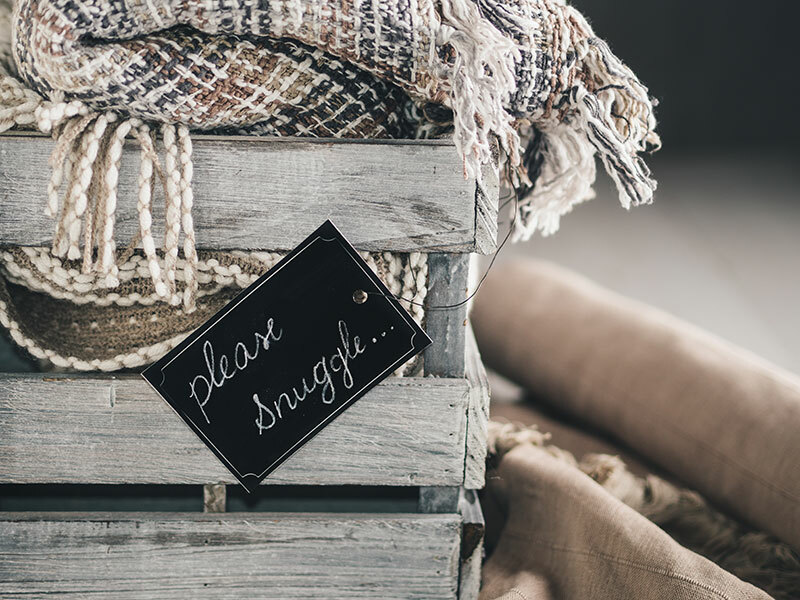 For a party, fill a large galvanized washtub or a wooden crate with throws or fur blankets. Choose a chunky knit throw like this H&M Moss-knit throw. Group together cable knit cotton throws, like the Rizzy Home version sold at Nordstrom. Go with faux fur. This Cheer Collection blanket features faux fur on one side and microplush on the other. Build a roaring fire at the fire pit to keep guests toasty. 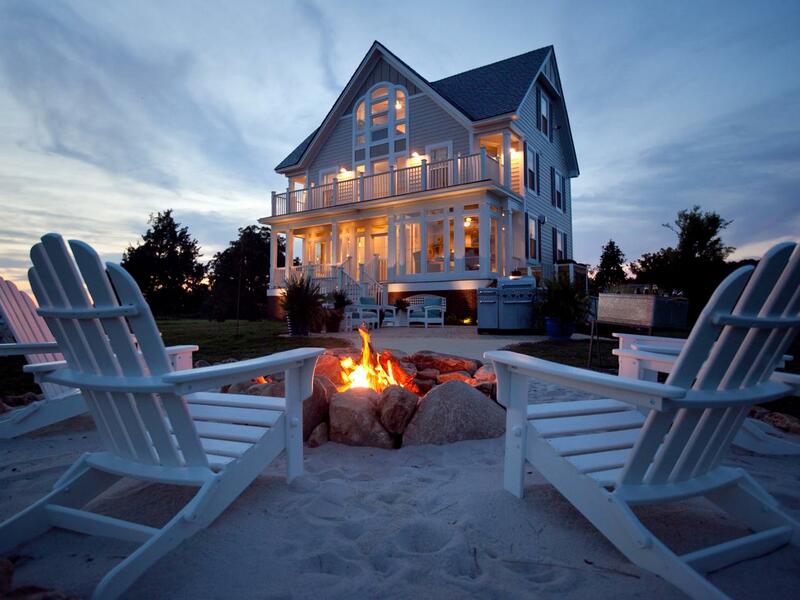 Arrange Trex Outdoor Furniture Adirondack chairs around the fire ring (but not close enough to melt the chairs!). 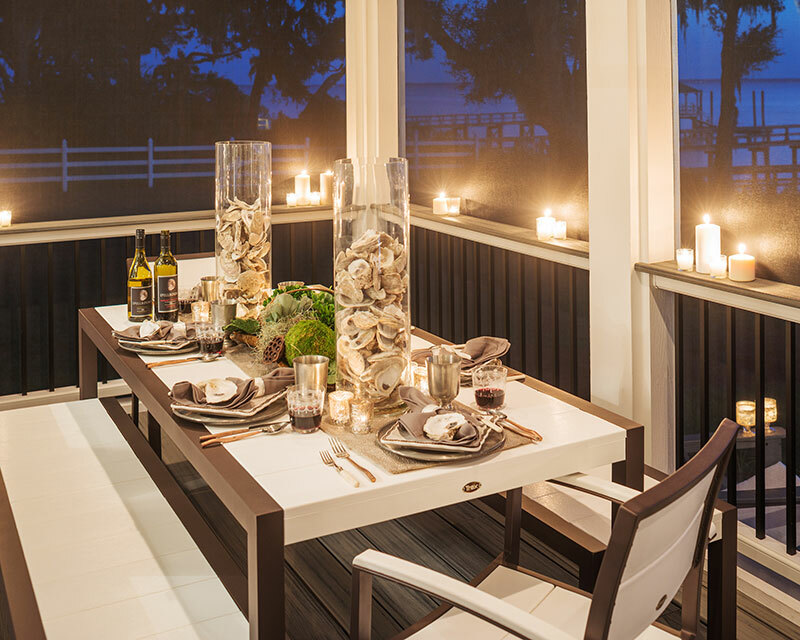 Add a small end table and set out marshmallows, skewers, and s’mores fixings to let guests help themselves. If you’re planning stories around the fire for kids, consider setting out hay bales for extra seating, topped with blankets. We also like the look of a pair of Rockport Club Sofas positioned near the fire. Fringe your patio edge with luminarias. Buy them from an outdoors store, or use paper bags with sand in the bottom. Use LED votive candles to avoid accidental fires. Adding as much ambient light as possible drives home the cozy factor. Create warm holiday appeal with birch bark candleholders. Here’s one from Martha Stewart. Table centerpieces or pots flanking a front door don’t have to be intricate to have that “wow” factor. Add bare branches to a tall glass vase, fill them with cuttings from your Christmas tree and hang small ornaments on them, or fill a glass container with cranberries or sprigs of winterberry. With these tips, you can add thoughtful touches of winter festiveness to any outdoor party! I can’t wait to try your idea on the chocolate covered spoons with crushed peppermint. Sounds so good, I know that my grandkids are going to love it, my adult kids will too. Thanks for great idea.